GhibliWorld reports that Frank Marshall and Kathleen Kennedy will produce the English localization of Hayao Miyazaki's Ponyo on the Cliff by the Sea, with a cast that includes Matt Damon, Tina Fey, Cate Blanchett, Liam Neeson, Lily Tomlin, Betty White, Fankie Jonas, Noah Cyrys and Cloris Leachman. 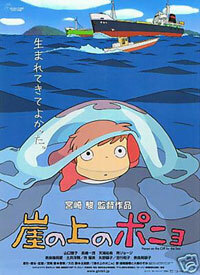 Gake no ue no Ponyo draws from his relationship with his son, Goro to tell the tale of a five year old boy's friendship with a gold fish who wants to become a human, employing a watercolor based look inspired by time that Miyazaki spent on a rental house by sea cliff. * Speculation is abound on when the movie will hit North American treaters. GhibliWorld says that test screenings are currently being held, the final version will screen in US theaters in 2009. ICV2 notes that there is evident that Disney may release Hayao Miyazaki's Ponyo on a Cliff By the Sea theatrically in North America in first quarter 2008. The article sites that Amazon.com is listing Viz Media’s The Art of Ponyo on a Cliff By the Sea for release on March 3rd, and AAA Anime has the release of the first volume of the Ponyo on a Cliff By the Sea Film Comic set for early April. 2005 when Miyazaki’s previous movie, Howl’s Moving Castle, debuted in theaters on June 10th, Viz Media released The Art of Howl’s Moving Castle on the 5th of July and The Howl’s Moving Castle Film Comic in August. In 2002 when Miyazaki’s Spirited Away premiered in theaters on September 20th, Viz Media released The Art of Spirited Away in October. Nausicaa.net reports Fandango.com has a listing for Ponyo with a release date of July 19, 2009 (a Sunday). * Pink Tentacle's coverage of Top 60 popular Japanese words/phrases of 2008 puts a Ponyo reference at the 20 spot. 20. “Ponyo, ponyo ponyo, the fish kid” (ponyo, ponyo ponyo, sakana no ko): This is a line from the theme song for anime filmmaker Hayao Miyazaki’s “Ponyo on the Cliff by the Sea.” Performed by Fujioka-Fujimaki (famous duo Takaaki Fujioka and Naoya Fujimaki) and eight-year-old Nozomi Ohashi, the song reached No.3 on the Oricon Weekly Charts in August. 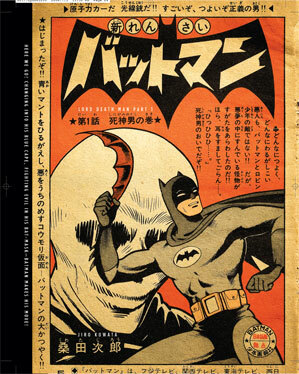 Win a Copy of Bat-Manga! There's still time to enter and room to win. 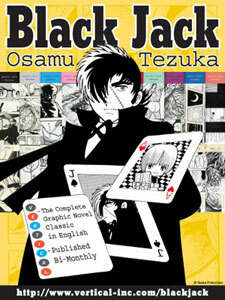 Win a Copy of Osamu Tezuka's Classic Medical Adventure Manga - Black Jack!